Distinguishing Characteristics Caucasian female. Graying brown hair, brown eyes. Tuccitto is missing part of one of her fingers due to a factory accident. Her maiden name is Macklin. 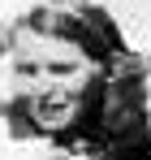 Tuccitto was last seen at her home in the 10 block of Commerce Drive in Portland, Connecticut on June 1, 1953. She has never been heard from again. She left behind five children. Few details are available in her case. Updated 1 time since October 12, 2004. Last updated May 11, 2016; casefile added.